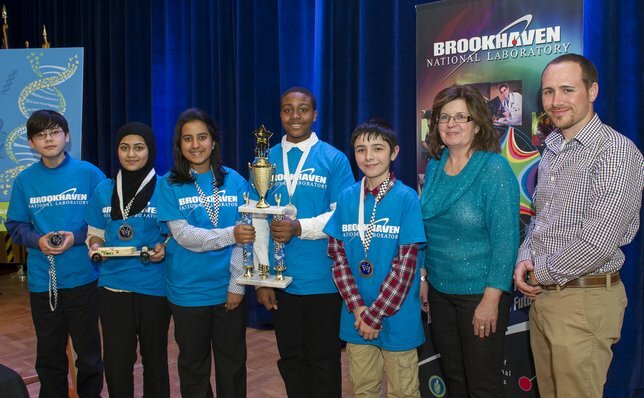 This past weekend, a team of young aspiring scientists from William Floyd Middle School (WFMS) competed at the Brookhaven National Laboratory Middle School Science Bowl. Upton, NY - March 7, 2014 - This past weekend, a team of young aspiring scientists from William Floyd Middle School (WFMS) competed at the Brookhaven National Laboratory Middle School Science Bowl and Lithium-ion Battery-powered Model Car Challenge sponsored by the U.S. Department of Energy. The team, in competition against 19 other teams from 12 other Long Island school districts, won a first-place trophy in their academic division and a second-place trophy in the Lithium-car timed trials. The academic team, led by Ms. Mary Nappi, an eighth-grade Regents Living Environment teacher and team head coach, competed in a Jeopardy-style tournament about mathematics and the sciences – physical, general, earth, life, energy and space. For their efforts they received the top award in their division. Additionally, under the direction of WFMS technology teacher John Rumpler, students designed, constructed and raced their eventual second-place lithium car. Congratulations to the students and teachers (pictured l-r) John Hangley (sixth grade); Khadija Saad (team captain, eighth grade); Fairhah Chowdhury (sixth grade); Sadat Gresham (eighth grade); Amir Abdualiev (sixth grade); and their coaches Ms. Mary Nappi, WFMS Regents Living Environment teacher; and Mr. John Rumpler, WFMS technology teacher. Super Bowl Sunday Events 2014: Are You Ready For Some Football? Subject: LongIsland.com - Your Name sent you Article details of "William Floyd Middle School Students Compete at BNL Science Bowl"